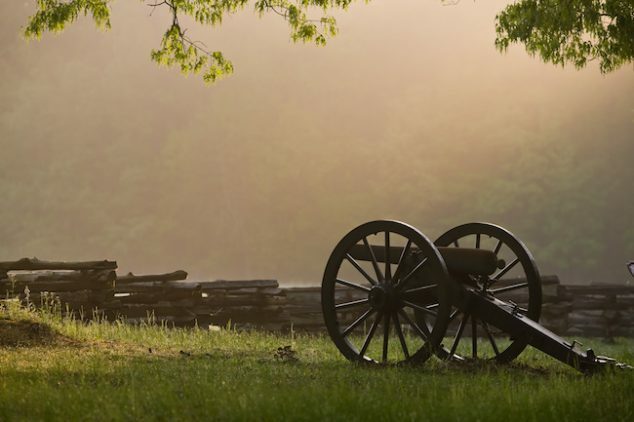 Illinois may not be able to claim fame as the location of famous Civil War battles, but this state was active in its contributions to the Civil War efforts. Illinois was responsible for providing more troops to the Union army than any other state. The city of Cairo, Illinois, is the city that occupies the southernmost location in the state, and this made the city of Cairo important as a staging area for organizing troops and materials that moved via nearby waterways. Ulysses S. Grant was assigned to the 21st Illinois Infantry Regiment, and he trained the troops in Cairo, Illinois. Cairo, Illinois, is located where the Mississippi and Ohio rivers meet at the southernmost tip of the state. Cairo was the location of Camp Defiance, created on the land between the Mississippi and Ohio rivers. After the firing on Fort Sumter, 6,000 troops from Illinois joined the cause to answer President Abraham Lincoln’s call. Both northern and southern states were dependent on the city of Cairo. Abraham Lincoln and Stephen A. Douglas were opponents in the 1858 race for U.S. Senate. As the two men campaigned, they participated in debates, held in seven different towns in Illinois. These debates attracted the attention of the entire nation. Douglas prevailed in the election, but Lincoln became well-known throughout the country. This notoriety was instrumental in his future election to the office of president of the United States. Southern Illinois, with its close proximity to the southern part of the country, had a significant population of first- and second-generation southerners. This group of people tended to have Democratic leanings and an opposition to the war. Because of these cultural issues, the Civil War was the catalyst of problems in this region. Many men from this area left home to join the Union army, but some chose to join the South instead. The state of Illinois as a whole took great pride in Lincoln because he was born in this state. Illinois supplied more than 250,000 men to the Union army. This state was also active in weapons manufacturing and the supply of iron products. Additionally, Illinois’ vast farmland made it possible for the state to supply both grain and meat for the Union. Abraham Lincoln’s “House Divided” speech, given at the state Republican Convention in June 1858, was the catalyst for his Senate nomination. Douglas fought for “popular sovereignty,” which gave citizens of a territory the right to permit or prohibit slavery. Douglas and Lincoln had a debate in Freeport, Illinois, on August 27, 1858. Lincoln and Douglas traveled through Illinois for four months, holding seven debates in front of crowds of up to 15,000 people. Stephen Douglas was hugely successful in the debates, and most people agreed that he was the winner. The 31st Regiment of the Illinois Volunteer Infantry was mainly comprised of volunteer recruits from Southern Illinois. This group fought in battles to remove Confederate soldiers from Missouri and Kentucky. Col. John A. Logan, a congressman from Illinois, was the leader of the 31st Regiment. Logan and his regiment were alongside Gen. Ulysses S. Grant in various battles, including Vicksburg. Eventually, Logan received a promotion to the rank of general. He and the 31st Regiment were present in eight major battles, one of which was the infamous Sherman advance on Atlanta. Southern Illinois was also the location of the building and refitting of river gun boats and various other support craft used in Civil War battles. Docks in Mound City, located on the Ohio River, served this purpose. Mound City is also the location of a national cemetery, with 4,800 Civil War veterans resting there. Some residents of Illinois were vociferously against the Union war effort. These people had the nickname of “Copperheads” because they had a reputation for swift and deadly violence. Copperheads often worked in gangs to commit various crimes. Southern Illinois residents actually succeeded in driving out a Copperhead gang, the Clingman gang, from the state. John A. Logan changed from being an energetic Democrat to a radical Republican. Logan was the highest-ranking civilian soldier in the Union army. Logan participated in the battle of Bull Run, not as a soldier but as a civilian. Logan was bold in his hatred for the Confederacy, and by association the Copperheads, during and after the Civil War. Gen. Logan was said to be Gen. Grant’s favorite officer. Civil War solders are buried in Woodlawn Cemetery, located in Carbondale, Illinois. At the end of the war, people brought flowers to the cemetery to decorate the graves of the soldiers. Some local dignitaries and a local clergyman were present at this ceremony. Logan was also there, participating in the ceremony. At the time, the citizens did not realize it, but this was the initial organized observance of the modern Memorial Day holiday. In 1868, as the national commander of the Grand Army of the Republic, Logan called for all GAR posts to observe a day of remembrance on May 30. This observance eventually became Memorial Day. After the Civil War, blacks began moving north to find work and new lives. Many of them moved through Cairo, Illinois. Unfortunately, life in the north was not what the former slaves had hoped. Without work and money to support themselves, they were forced to go back to the south. Many of them became sharecroppers. Public education became a priority after the Civil War. The Illinois General Assembly passed legislation to fund advanced education of public school teachers. Part of this legislation involved the creation of a learning institution, called the Southern Illinois Normal University at Carbondale. This institution achieved full university status, also developing a reputation as an institution of research. In 1947, the school became the Southern Illinois University. On May 5, 1868, Logan issued an order regarding Memorial Day. Logan may have chosen May 30 as Decoration Day due to the prevalence of blooming flowers at this time. The first national celebration of Memorial Day occurred on May 30, 1868, at Arlington National Cemetery. Logan had an earnest desire for his fallen comrades not to be forgotten. The Grand Army of the Republic was an organization of former Union soldiers and sailors. Southern Illinois is also rich in raw materials, often used today by home remodeling and home plumbing companies, and these helped the state to rebound after the ravages of the Civil War. Clay in abundance in this region has been used to make bricks for building construction. The state of Illinois exported bricks in large amounts during the 1870s. The building of the Panama Canal even included bricks made in Illinois. Fluorite is a crystallized mineral in abundance in southern Illinois. Mines of fluorspar produced materials used for making both glass and steel before the Civil War. In 1810, in Murphysboro, Illinois, commercial coal mining began. This industry quickly became strong in southern Illinois. But problems between miners and mine owners resulted in a number of feuds in the late 1800s and early 1900s. The main clay minerals present in Illinois include chlorite, illite, kaolinite, montmorillonite, and vermiculite. Fluorite mines in southern Illinois were very active during the 1950s and 1960s. More than 4,500 coal mines have been in operation since commercial mining started in Illinois in about 1810. At one time, Illinois was the top producer of fluorite in the United States. Many bloody coal wars transpired in Illinois due to disagreements between miners and mine owners. You state: Illinois is proud of Lincoln, because Lincoln was born in that state. Abraham Lincoln was born in Kentucky; grew up in Indiana; and moved to Illinois when he was 21 and free to do so. This makes the rest of your “facts” suspect, to say the least.